San Francisco—If the D.I.C.E. Awards are the video game industry's Oscars, then the Independent Games Festival (IGF) Awards and Game Developers Choice (GDC) Awards are...well, the game industry's other Oscars. Taking place on Wednesday during the Game Developers Conference each year, this double-helping of award show pomp and circumstance doles out accolades to the industry's top studios, games, and developers. Votes for both shows are cast by panels comprised of noteworthy industry figures, drawn from the global community. And just like last year—when Journey beat out most AAA games for top honors—independent games showed Wednesday night that the split between the IGF Awards and GDC Awards is largely fictional and unnecessary. "In the past few years this community has grown radically. It's grown fractally," said Brandon Boyer, Chair of the IGF, in a speech to open the show. The community's grown so much, in fact, that it's spilled past the bounds of the IGF and taken over both shows. Don't let Papers, Please's NES-esque graphics fool you: The game is amazing. Papers, Please—which was PCWorld's Game of the Year for 2013 —took honors in each, scooping up wins in the IGF Awards for Excellence in Narrative, Excellence in Design, and the Seumas McNally Grand Prize, as well as the GDC Awards for Innovation and Best Downloadable Game. The Fullbright Company's Gone Home won the GDC Award for Best Debut, The Stanley Parable took the IGF Audience Award (voted on by the Internet at large), and Kerbal Space Program took the GDC Audience Award. All in all, out of nineteen awards presented Wednesday night, only seven went to big-budget games—and three of those went to The Last of Us for Best Design, Best Narrative, and GDC Awards Game of the Year. 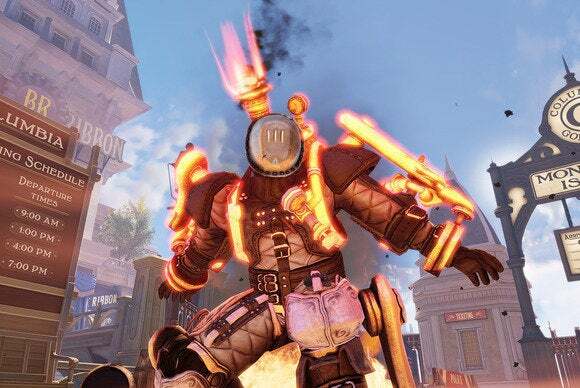 BioShock Infinite also snagged two awards, for Best Audio and Best Visual Art, while Grand Theft Auto V picked up Best Technology. Is it any wonder that Bioshock: Infinite snagged an award for Best Visual Art? On the independent side, Device 6, Gorogoa, Luxuria Superbia, and Risk of Rain also scored awards. The GDC Awards also feature a number of special recognitions—the Lifetime Achievement award, the Ambassador Award, and the Pioneer Award. The Lifetime Achievement Award went to ex-Sony Computer Entertainment CEO Ken Kutaragi for his role as "Father of the PlayStation," which he helped develop in the early '90s. The Pioneer Award went to Brandon Beck and Marc Merrill of Riot Games for their efforts to build up the eSports community. With over 67 million players worldwide, Riot's League of Legends is one of the most popular games in the world. Last year Riot even rented out the Los Angeles Staples Center to host its World Championship—and the event sold out. Anita Sarkeesian received the Ambassador Award for her work on Feminist Frequency, a web series that endeavors to reveal sexist tropes in pop culture. Her current work with games has deconstructed many problematic story crutches, like the damsel-in-distress framework, and resulted in a constant stream of Internet hatred (and death threats) aimed in her direction. It was fantastic to see the industry pay its respects to Sarkeesian, even if change is slow in coming. In his introductory speech, The Last of Us writer Neil Druckmann even said Sarkeesian's work was pivotal in shaping the way his own story came together—quite a piece of praise, considering that story won Best Narrative.